If you’re looking for a delicious chewy no bake granola bars recipe your kids will eat up, I have just the one for you. If I purchased the amount of granola bars my family could eat up all at the grocery store, I would have to take out a small loan. Making them saves me money and I can put whatever add-ins, like chocolate or peanut butter chips, I want to. 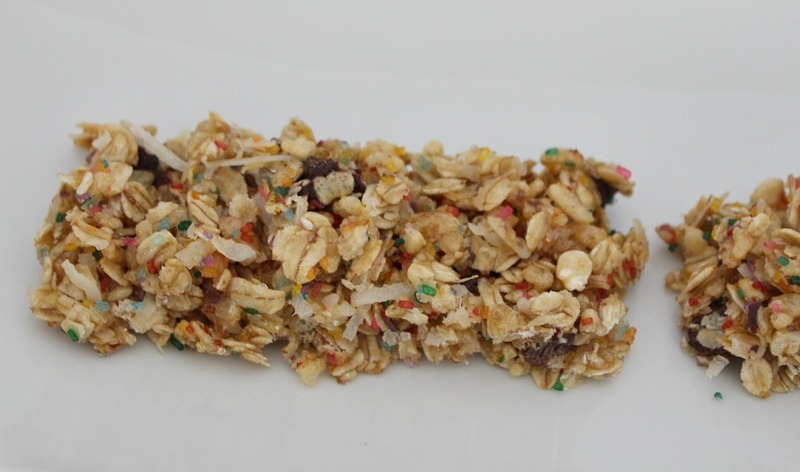 For the granola bars pictured above, I put in some sprinkles and chocolate chips. They look festive and the sprinkles added a nice crunch. 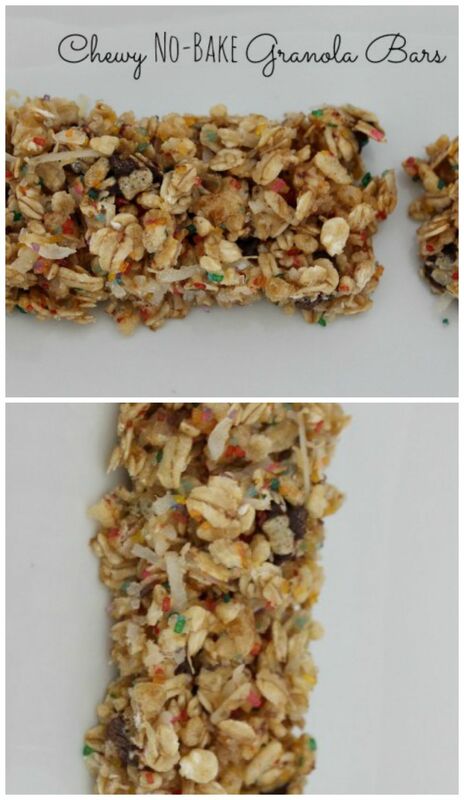 I was actually experimenting with sprinkles for some Valentine’s Day granola bars and this was the result. They look more like Easter colors, but no matter what the Holiday, they tasted delicious. I used the same recipe as my Homemade granola, except instead of putting it on a cookie sheet, I put it in a lightly greased 9×13 pan or 9×9 if you like really thick granola bars. Before you cut them, you need to put them in the refrigerator for about 30 minutes. I actually store mine in the refrigerator because we like them cold. I also pack them in the kids’ lunches and the kids like them better after they’ve been in the refrigerator. Speaking of my kids’ lunches…one of their friends asked “Um, why is your granola bar in a baggie?” She said “Because it’s homemade.” Then she said “You can make granola bars?” Ha! Why yes, yes you can my friend! And they’re so much better than store bought! I keep them in snack baggies in a container so they’re easy to grab and go. They’re a favorite go-to snack of ours. I’ve had all kinds of requests for different variations. My favorite is the classic chocolate chip. You just can’t beat it in my book! 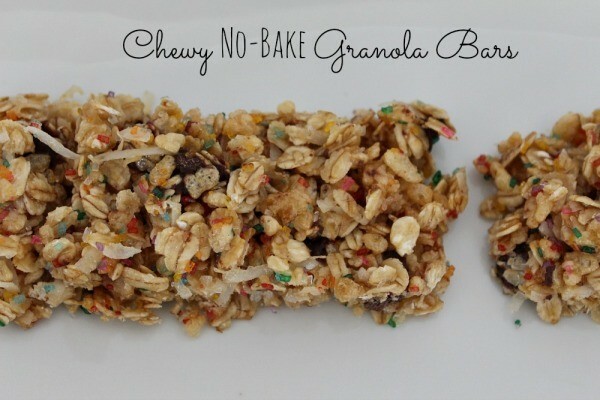 A chewy no-bake granola bar recipe that's better than store bought. You can experiment with the different add-ins and make all kinds of variations. 1. In a large bowl, mix together the oats, rice crispy cereal and shredded coconut. Set aside. 2. In a large sauce pan, melt the butter over medium heat. After the butter is melted, add the brown sugar, honey and salt and mix together. Turn the heat up to medium high to get a good roiling boil. Let the mixture boil for 2 1/2 minutes. Keep a close eye on it and make sure it doesn't boil over. Otherwise, don't stir it. Just let it do its thing. 3. Remove from heat and add vanilla. 4. Pour the butter mixture over your dry oats mixture and mix well. 5. If you're adding any kind of chocolate chips or peanut butter chips, let the mixture cool before you add them or else they'll melt. After it's cooled stir in the chips. 6. Spread in a lightly greased 9x13 inch pan. Press down a little so the granola sticks together. 7. Place in the refrigerator for 30 minutes. 8. Cut into rectangle shapes. Either place in individual snack baggies or keep in pan. 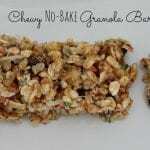 Do you have a favorite brand of granola bars or recipe? Let me know!